As an emerging fashion designer, you are building your brand. And, building your brand is going to take a long time. It will consist of creating a solid product, carving out your space in the market with a clear point-of-view and being consistent to gain trust and stay relevant to your target. One way to build your brand is through strategic partnerships. Now, these shouldn't be just one off events, but relationships that you build with people and companies over time. That's why it's so important to evaluate each opportunity that comes your way to make sure that it's a fit with your business. Another reason for being selective is because the fashion space has become extremely cluttered due to a democratic fashion world that is constantly outputting opportunities for young designers such as incubators, new retail models fueled by technology, pop-up shops, trade shows, press opportunities from both traditional and new media along with everything in between. With that said, it's easy to jump on an opportunity with the hopes of exposure and awareness for your brand. For many young designers, the default sentiment is "I'll give it a try or it sounds like a good idea" without thinking through the partnership. On one hand, it could be fruitful, but it can also be disappointing if not assessed strategically. This is why it's vital for you to make thoughtful decisions on how you choose to work with others. 1. Who is the company or individual you are partnering with and how are they involved in the fashion industry? Is it your niche? 2. Do they have expertise and a proven track record or will you be building something together? 3. 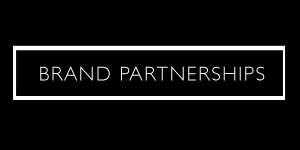 Is the partnership going to be a financial commitment or explicit mutually beneficial terms that fit your brand's objectives as there's nothing worse than feeling like you didn't get a return on your investment. 4. Are they professional in person, over the phone and on paper? And, on social media too? 5. What are their values and ethics and do you share the same vision? 6. Are their partners aligned with yours or does it seem like a smattering of logos that unite? 7. What can you leverage from them and vise versa? This could include email blasts, introductions, cross promotion or exposure through their social clout. 8. Do your aesthetics match? Do they hold the same voice and imagery that will uplift your brand? 9. Are they original and authentic or do they seem like a knock off of another concept? 10. Will you like working with them? 11. Have you checked their references or is their a source that you can contact to validate their offerings and credibility? 12. Does it feel right? Gut and intuition are important feelings that shouldn't be dismissed because you have to be confident with any relationship you chose to participate in. In the end, it's important to develop your brand's criteria for evaluating a partnership because every touch point that involves the growth of your brand should never be overlooked because whether it is big or small, everything matters.